You’ve recently learned one of your teeth needs a root canal treatment. It’s absolutely necessary: for example, if you have decay present, it will continue to go deeper within the tooth and it will spread to the roots and bone and could ultimately cause you to lose your tooth. 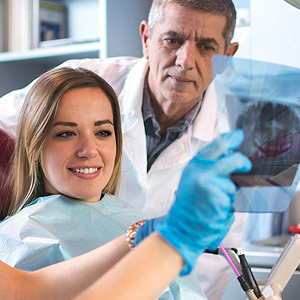 Although you’re a little nervous, we can assure you that if we’ve recommended a root canal treatment, it’s the right step to take for your dental health. There’s nothing mysterious — or ominous — about a root canal. To help ease any fears you may have, here’s a step-by-step description of the procedure. Step 1: Preparing your mouth and tooth. We first take care of one of the biggest misconceptions about root canals: that they’re painful. We completely numb the tooth and surrounding tissues with local anesthesia to ensure you will be comfortable during the procedure. We isolate the affected tooth with a thin sheet of rubber or vinyl called a rubber dam to create a sterile environment while we work on the tooth. We then access the inside of the tooth — the pulp and root canals — by drilling a small hole through the biting surface if it’s a back tooth or through the rear surface if it’s in the front. Step 2: Cleaning, shaping and filling the tooth. Once we’ve gained access we’ll clear out all of the dead or dying tissue from the pulp and root canals, and then cleanse the empty chamber and canals thoroughly with antiseptic and antibacterial solutions. Once we’ve cleaned everything out, we’ll shape the walls of the tiny root canals to better accommodate a filling material called gutta-percha, which we then use to fill the canals and pulp chamber. Step 3: Sealing the tooth from re-infection. Once we complete the filling, we’ll seal the access hole and temporarily close the tooth with another filling. Later, we’ll install a permanent crown that will give the tooth extra protection against another infection, as well as restore the tooth’s appearance. You may experience some mild discomfort for a few days after a root canal, which is usually manageable with aspirin or ibuprofen. In a week or so, you’ll hardly notice anything — and the tooth-threatening decay and any toothache it may have caused will be a distant memory.